Today Music.Film Recordings and Varèse Sarabande releases the SHOCK AND AWE – Original Motion Picture Soundtrack digitally and on CD July 13, 2018. The album features original score composed by Emmy Award Winner Jeff Beal (AN INCONVENIENT SEQUEL: TRUTH TO POWER, HOUSE OF CARDS). A five-time EMMY® winner, Beal’s approach is a favorite for more sophisticated works. His TV credits include HBO’s ROME, CARNIVÀLE and the Netflix series HOUSE OF CARDS. His documentary work includes BLACKFISH, WEINER, THE QUEEN OF VERSAILLES, AN INCONVENIENT SEQUEL: TRUTH TO POWER, Oliver Stone’s THE PUTIN INTERVIEWS, and BOSTON the recently released documentary about the history of the Boston Marathon. Jeff’s upcoming projects include the documentaries THE PRICE OF EVERYTHING (directed by Nathaniel Kahn) and GENERATION WEALTH (directed by Lauren Greenfield), and the upcoming series GRAND HOTEL on ABC. Recently, Jeff’s performing, conducting, and composing worlds have begun converging. He conducted The National Symphony Orchestra at the Kennedy Center in the premiere of HOUSE OF CARDS IN CONCERT (represented by Columbia Artists Management), with further performances in Miami, The Netherlands, and Denmark. He also led the Hollywood Chamber Orchestra for the premiere of BLACKFISH live-to-picture and conducted the Boston Pops Orchestra live for the premiere of BOSTON. In May several of his pieces were performed including “The Salvage Men” by The Apollo Chorus (Chicago), the Brooklyn Youth Chorus premiering his piece “The Fire Brand” at BAM, and Oregon Ballet Theatre premiering the ballet Terra, choreographed by Helen Pickett. 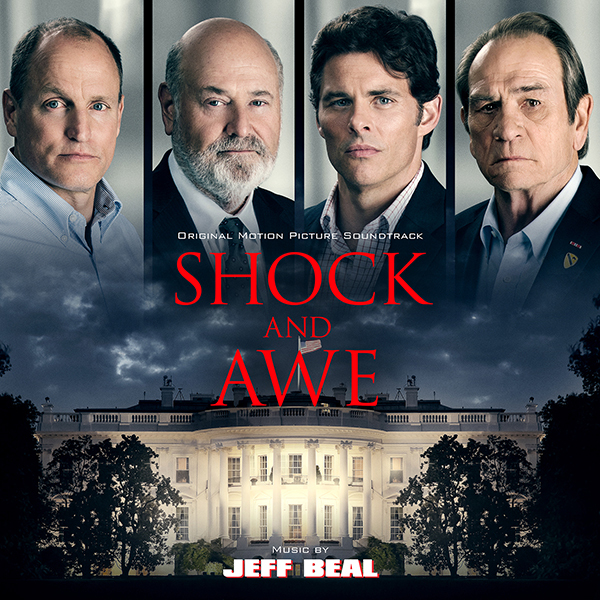 Castle Rock Entertainment, Vertical Entertainment, DirecTV Cinema present SHOCK AND AWE, currently viewable via DirecTV and opening in theaters on July 13, 2018. Music.Film Recordings and Varèse Sarabande are releasing the SHOCK AND AWE – Original Motion Picture Soundtrack digitally and on CD July 13, 2018.